It is not uncommon to hear mathematics described as boring, difficult, abstract, confusing, or irrelevant. In fact, many of these descriptors are used often by students when talking about their mathematics classes. Coupled with worry, discomfort, and other negative views toward numbers, these feelings could be attributed to mathematics anxiety. Mathematics anxiety can be defined as extreme feelings of angst that impedes one’s ability to work with numbers and perform various mathematical tasks. 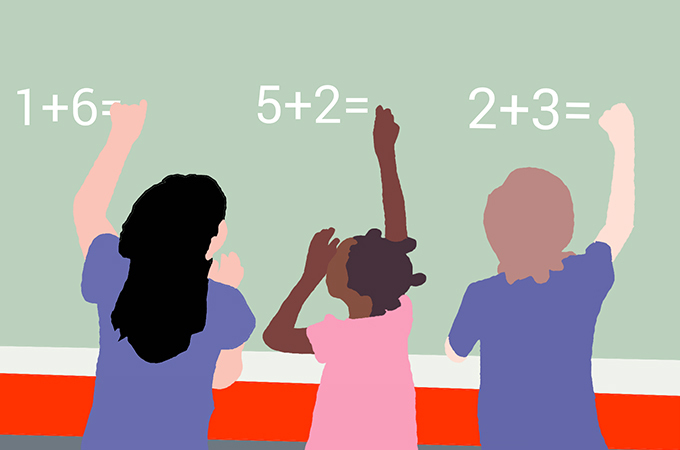 Students tend to experience a disconnect with the content, which leads to underachievement and deters their interest in studying mathematics and handling daily functions involving numbers. Mathematics anxiety has existed for centuries and can be found among people of all ages. Its development is often connected to experiences in school and teachers are a major contributor to students’ angst through the attitudes they exhibit and instructional strategies they employ. Determine orally or through writing each student’s individual beliefs about learning mathematics. Find out their best and worst mathematics experiences and use that information to drive your instruction and planning. Actively anticipate and identify potential topics that may present challenges in student comprehension and support students through these areas of trouble. Prompt students to draw upon their prior knowledge, and bridge connections to new and challenging material. Integrate real-world examples and students’ interests into your instruction to allow them to connect personally with the content. Make efforts to acquaint yourself with the diverse students in your class and how they learn best. Remember, one size does not fit all when it comes to teaching. Build strong, professional relationships with your students. Get to know them, maintain an approachable demeanor, and strive to create an environment where they feel safe, supported, and encouraged to learn and always try their best. Students should be encouraged to ask questions, take risks, and make mistakes free of judgment, as all of these components are critical pieces of the learning process. Teachers must believe all of their students can be successful in learning mathematics and reflect this certainty in their instruction and attitude. Being equipped with both a strong foundation of content knowledge and effective pedagogical strategies that cater to diverse learning styles will strengthen students’ learning experiences and may reduce feelings of anxiety. Rebuilding students’ confidence in their mathematics skills will not only afford them positive classroom experiences and performance improvement, but also a more successful life as problem solvers and critical thinkers.